Apple Inc. won’t be the only one cashing in on today’s iPhone 4 launch in Canada, as crafty entrepreneurs and charitable do-gooders piggy back on the marketing frenzy. The iPhone 4 is on sale now at stores across Canada. Carriers including Telus Mobility, Bell Canada, Rogers Wireless, and Fido are selling the device, as are retail locations such as Best Buy, Wireless Wave and Future Shop. Apple Stores opened doors early at 7 a.m. to sell unlocked versions of the phone, giving customers a choice of what carrier they could use. Some self-proclaimed “digerati” were already lined up on Thursday morning at Vancouver’s Pacific Centre Apple Store, prepared to wait 24 hours to buy the device. But Kerry Morrison and Chris McGuire will be doing more than just passing the time as they camp out. They’ll be offering up digital services to those willing to donate to charity, winning some valuable exposure to their entrepreneurial ventures as a result. In a phone conversation with ITBusiness.ca yesterday, Morrison reported collecting $500 in the first two hours of waiting in line, and a jam-packed schedule of work to come. Morrison runs Reason Intelligent Design, a Web marketing firm and iPhone application developer. He’s accompanied in line by Chris McGuire, a new media manager for a Vancouver-based interactive company, who also freelances his work on the side for anything tech related. All money raised by the digital duo over the day will go to Kayak For A Cure, a group of kayak-loving Vancouverites who raise funds for cancer cures research. The main point may be to raise money for charity, but the exposure will likely help the two attract some new clients as well, McGuire says. Attention around the iPhone 4 launch also boosted the fortunes of Gary Ng, founder of the iPhone in Canada blog. The Vancouver resident started the blog in December 2007 when he drove across the border to buy the original iPhone. When he brought it back to Canada to use it, he had to perform a complicated “jailbreaking” procedure, but wasn’t technically inclined enough to do so. He had trouble finding Canadian specific information on forums, so he decided to start his own. Ng still has a day job as a teacher for middle school and high school, but says blogging has proven to be a lucrative side project for him. Ng will be waiting in the same line-up as Morrison and McGuire, handing out some free accessories for the iPhone from his blog sponsors. Apple doesn’t provide him with an iPhone 4, so he’ll have to wait in line to buy one like everyone else. That’s a lost opportunity for Apple, says Roberta Fox, president of Mount Albert, Ont.-based Fox Group. Still, those able to borrow some of the hype of Apple’s product launches stand to benefit from some inexpensive exposure, the consultant adds. But it might not be appropriate for any business to bank on Apple’s marketing – it probably works best for those who are consumer oriented, and small. Not every one lining up early at Apple storeshad a secondary agenda. 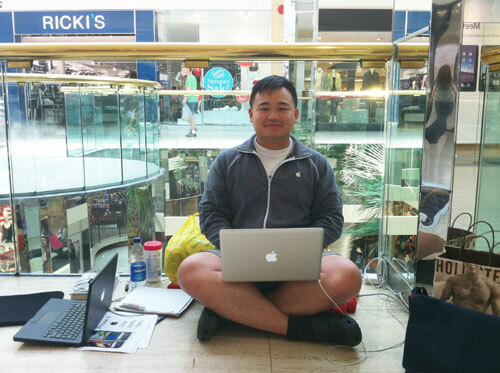 Alex Lee is a Dubai-based business consultant that claimed the first spot in line at the West Edmonton Mall 24-hours ahead of launch. He already had one iPhone 4, after waiting 32 hours at a UK location ahead of the June 23 launch there – but he wanted another one for a family member. Alex Lee waits at West Edmonton Mall for the iPhone 4 launch. Photo taken with his iPhone 4. Existing iPhone models have proven useful for some small business owners, Fox says. Fox relies on an iPhone to show off her catalogue and place orders from clients. For Morrison, he can’t imagine how he’d run his business without his trusty iPhone in his holster. He counts on Apple’s products to collaborate amongst freelance workers strewn across eight different countries. Morrison and McGuire’s work set-up in line serves as case-in-point. The duo sat on lawn chairs, working on Mac Books. They tethered an iPhone to get an Internet connection, find themselves just outside the range of a nearby coffee shop’s Wi-Fi network. Both “digerati” plan to buy the unlocked version of the phone, which will help them save on roaming charges when travelling abroad. Follow Brian Jackson on Twitter and check out the IT Business Facebook Page.